Deep clean and brighten your skin with this specially formulated toner! This toner has a pH level of 5.5 to effectively balance your skin. Peony extract and a high concentration of licorice water seep into skin to add an extra dose of luminosity to your complexion. 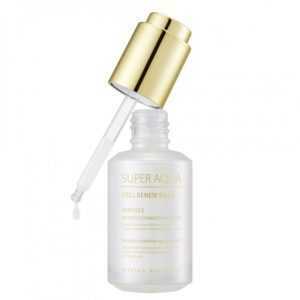 Green tea extract also helps calm and reduce pigmentation, including acne scars and dark spots. 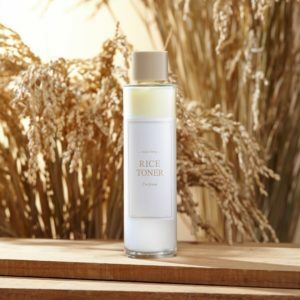 This toner will keep your skin clean, plump, and glowing everyday! Get to try the best of all Banila co cleansing balms with this special 4kit set. This bestselling cleanser is in sherbet when you scoop it, but melts into an oil-type makeup and residue remover as you massage it over your skin.Its sorbet-soft, lightweight texture effortlessly dissolves stubborn makeup without stripping your own natural oils.Papaya extract works to naturally exfoliate the skin and acerola extact is rich in vitamin C which helps to brighten.Follow with a water-based cleanser. The Acid Duo Mild Gel Cleanser is a gentle cleanser containing Capryloyl Salicylic Acid LHA and Gluconolactone (PHA) that cleanse the skin from dead skin cells and impurities. 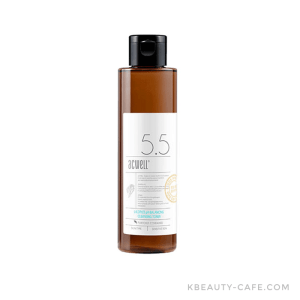 With the pH level of 5.5, it helps restore the skin’s pH balance and is gentle to the skin. A moisturizing UV gel with A lecithin and skin-freindly liquid formula that lightly glides a thin layer onto skin with a clean finish. Non-sticky gel type that glides on skin lightly to deliver fresh application without any greasy feeling. 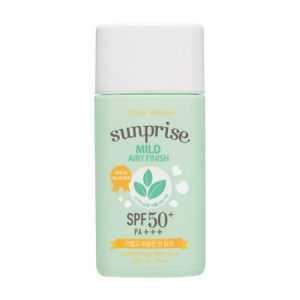 A 100% mineral based mild ingredient sunscreen for sensitive skin,with a non-sticky,no greasy and a smooth finish. 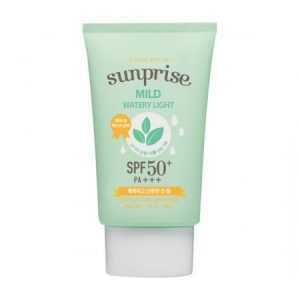 Containing 20 kinds of vegetable ingredients to protect skin from UV perfectly. Rice water has been used by Asian Women since ancient times to maintain their skin.Geishas were known to use rice water to wash their faces in a bid to get smooth, supple, and luminous skin. Rich in antioxidants,minerals and vitamins,rice water helps to tighten pores,lightens and brighten skin for a smooth,porcelain complexion. 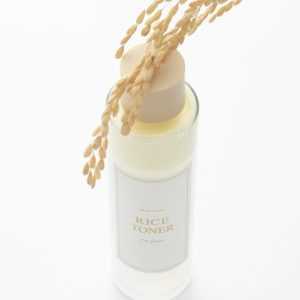 I’m from rice toner made with 77.78% goami rice extract hydrates and brightens dull, irritated skin. 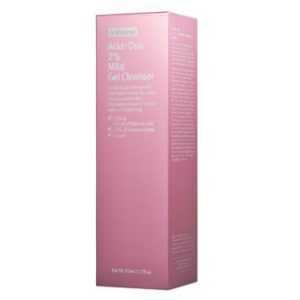 this toner gently exfoliates dead cells build up that causes the skin to look dull and promotes a smoother,brighter complexion. niacinamide (vitamin B3) which is a powerful antioxidant that acts as an anti-inflammatory, improves your skin elasticity, enhance the skin barrier function and also it helps to even out skin tone and reduce post-inflammatory hyper-pigmentation. Adenosine is yeast derived and has anti-aging, anti-wrinkle, skin restorative and anti-inflammatory properties. Japanese elm bark is an anti-inflammatory and has skin soothing benefits, while Japanese elm root bark has been used as a medicinal herb in Korea for anti-inflammatory benefits and to help skin issues. Amaranth seed extract is known as the “Treasure of Inca” and naturally contains squalane to deeply hydrate and moisturize your skin. Amaranth also has anti-oxidant properties and will increase cell activity, so it will help regenerate and protect your skin. Portulaca oleracea prevents dryness of skin and soothes skin with its excellent moisturizing ability. 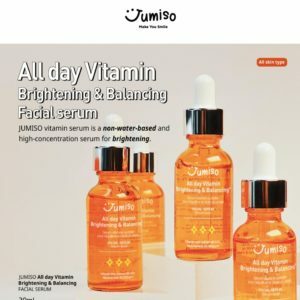 Jumiso All day Vitamin Brightening & Balancing Facial Serum dramatically improves the appearance of hyperpigmentation and uneven skin tone while respecting your complexion’s delicate balance to leave it silkily conditioned as well as comfortably clean. 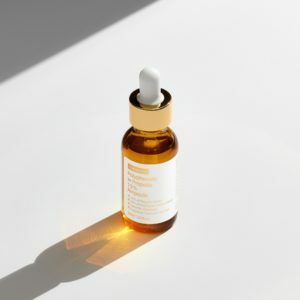 Lightweight and non-greasy, this super-potent serum is brimming with essential nutrients and antioxidants that works together to keep hand visibly glowing, plump and even throughout the day. Crafted with 86.14% Vitamin Tree extract, this non-water based formula refines, brightens the appearance of skin and minimizes signs of aging. Centella Asiatica Extract helps in healing acne scars, calming inflammation and accelerating cell turnover for a clearer and softer skin. 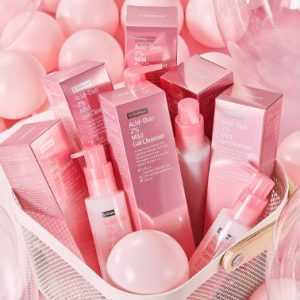 To finish the rich formula, it also contains Chamomilla Recutita (Matricaria) Flower Extract and Hyaluronic acid that regulate sebum production and provide long-lasting hydration and suppleness. 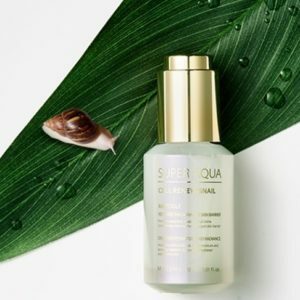 65% Snail slime extract repairs,replenishes dehydrated skin and strengthens weakened skin barrier.EGF Complex and Baobab seed extract improves moisture retention and provides rich nutrients for skin. EGF (Epidermal Growth Factor) is the key to strong, smooth skin!EGf Complex has powerful anti-aging benefits and helps smoothen out wrinkles for a youthful complexion. loss of EGF is one of the main causes of aging skin. The Aqua Sun Gel features a double layer technology, making it sweat and water resistant, while its water get texture allows for fast absorption. Formulated with glacier water and antioxidant-rich ingredients like green tea and chrysanthemum extract for anti-aging protection from free radical damage, this sunscreen cools skin upon contact as it hydrates. usage:As the last step in your skin care routine, apply to your face and body as needed. Pat in to absorb. Reapply every two hours or after swimming or sweating. Missha’s Velvet Finish Sun Milk provides strong protection against both UVA and UVB rays . It has refreshing, lightweight,quick absorbing,no greasiness and a velvety milky textured that doubles as a makeup primer . Contains Helichrysum flower water to calm and soothe skin. Natural Barrier Complex and Edelweiss flower/leaf extract protect skin from harmful environmental factors, while hydrating and nourishing the skin. Great for all skin types, especially those with oily skin types. A nourishing sleeping pack with enriched nutrition (Honey) to provide a moisturizing benefit and healthy skin glow at the same time. MISSHA Pure Source Pocket Pack (Honey) is a sleeping pack to help make a radiant skin as if flowing with honey during sleep. Elastic gel texture to provide nourishing feeling and promote a bouncy skin.